Worker cooperatives are a valuable tool for creating inclusive businesses owned by those commonly exploited in the mainstream economy, especially often-abusive domestic work. The sector has boomed in recent years with unprecedented levels of public and philanthropic support (both in terms of funding and legislation). Worker co-ops pay higher wages than conventional firms while also generating higher profits via increased productivity. They are often transformative for their members and effective at building community wealth. On the other end of the spectrum, franchising represents one of the most powerful methods for scaling businesses on the planet. In the US, one in every seven businesses is a franchise, with over 800,000 franchise outlets nationally that employ over 7.6 million people. Critics decry franchises as exploitative entities, responsible for low wages and cultural homogenization, while proponents tout their positive impact on economic development. The Center for Family Life (CFL) is a program of SCO Family of Services.1 The Center for Family Life, based in Brooklyn, provides social services—and, since 2006, has also become a developer of worker co-ops. Until now, worker co-ops and franchising have existed in entirely separate worlds. Now, however, CFL is knitting together these two seemingly disparate worlds, creating a new nonprofit cooperative franchisor called Coopportunity. CFL’s goal is to build a model that can scale nationally through collaborations with local partner nonprofits. Coopportunity is licensing co-op franchises in the cleaning industry under the trademarked brand Brightly®. Coopportunity also owns the childcare brand NannyBee®, which it may franchise in the future. Since 2006, CFL has developed 21 worker cooperatives. Eighty-seven percent of its co-op member-owners are immigrants; 85 percent are women. On average, members of these cooperatives earn over $18 an hour. They also share in annual profits, benefit from labor protections, and develop leadership skills. Until 2016, CFL developed each co-op as a standalone business. The work had a big impact, but CFL couldn’t keep up with demand. “There’s no reason cleaning co-ops shouldn’t dominate the market,” says CFL’s Cooperative Development Program Director, Maru Bautista. “Yet their collective market share is less than one percent.” In a country with over 43 million immigrants, many of whom work in exploitative home service industries where immigrants comprise 46 percent of the workforce, there is compelling need to scale this model. These factors led CFL to begin researching promising models starting in 2015. The experiences of the Teamworks Development Institute and the Arizmendi Association of Cooperatives in California, the Mondragon Cooperative Corporation in Spain, and the CCA Global Partners purchasing co-op all shaped their thinking. The fruit of this research is Coopportunity, which was legally incorporated as a nonprofit last spring. It owns both the Brightly and NannyBee brands. In September 2018, Brightly was approved as a franchise in New York state, making it the first US worker co-op to be so recognized. Currently, one NannyBee, and two cooperatives in the process of joining the Brightly system operate in New York City, with a third Brightly in development. There are 57 mostly low-income immigrant women presently in these co-ops, either as worker-owners or as “candidates” on the path to becoming worker-owners. Under the franchise co-op model, each local base co-op will pay five percent of their gross revenue to Coopportunity. Coopportunity’s board has a majority of seats reserved for outside experts who can help grow the system, and a minority of seats for members of the base co-ops, who represent worker-owners in general. In order to fuel the growth of the cleaning co-ops, CFL also developed a client-facing app called Up & Go that allows these businesses to better compete in the increasingly crowded digital market for cleaning services. The model aims to build efficiencies of scale in co-op incubation and operations, shared back office services, and marketing. These include uniform services and prices, detailed startup guides, and the Brightly franchise operations manual. Coopportunity’s financial projections show it breaking even in 10 years if it manages to create eight successful franchise coops. The model is built to scale nationally, especially to places like the 20 states without a single worker co-op, through collaborations with local partners. These are nonprofits that want to bring a worker co-op to their community, but who aren’t equipped to take on the whole task of developing a co-op from scratch. These organizations provide on-the-ground resources, connections, and support, while benefitting from the resources associated with the franchise. At first, convincing co-op members to sign on was a hurdle. The existing successful co-ops opted out, as did the co-op that was meant to start the nanny franchise. One issue is that the value proposition is weakest for the founding co-ops. Their brands, reputations, and systems could greatly advantage those who follow, but these co-ops had already done this work. Of course, founding co-ops could benefit from greater brand recognition, but realizing those benefits takes time. Another set of challenges involved the business model. While CFL has incubated worker co-ops for over a decade, fundamental changes to the business model are needed to scale. While the oldest co-ops have flourished, and are self-sustaining, they are incorporated as “referral model” co-ops. The Brightlys and NannyBees are all limited liability corporations (LLCs), which have higher administrative costs and are subject to NYC’s burdensome Unincorporated Business Tax (UBT). This is especially challenging given the thin margins of domestic work industries. Cleaning and childcare are sectors that thrive by paying low wages to workers. So, any business model built on guaranteeing living wages already faces an uphill battle. Financing also poses challenges. Right now, financing is dangerously concentrated in New York City’s limited discretionary co-op development funds. While CFL is pursuing diversified sources of funding, at this point, should the funds fail to be renewed, the project would face a serious threat in its crucial growth phase. Finally, an anticipated, but still difficult, hurdle has been identifying the right set of agreements to govern the franchise co-op system. All franchises in the US must publish a Franchise Disclosure Document (FDD), a lengthy text with details about the franchise system and requirements. For the Brightly franchise, it has been a grueling process to create an agreement that both protects the overall system, while also protecting worker-owners’ rights. It’s also difficult to make a document that is both comprehensible and acceptable to immigrants, who are understandably suspicious of being cheated by complex lawyerly contracts. Brightly’s original FDD was 202 pages long and made scant mention of the project’s social justice purpose. It had to be substantially rewritten to be brought into sync with co-op governance and management structures. Early impact indicators are promising. The average length of time it takes for a Brightly to go from their first training to launch was reduced by 34 percent, and the co-ops began to earn income 42 percent earlier than their counterpart standalone co-ops. Trust building and collaboration among co-op members has been another big achievement. “The members starting out motivate me and vice versa; we all motivate each other to keep going,” notes Ms. Dominguez. The standalone co-ops tend to be weakly networked, so this level of collaboration is especially noteworthy. Early experiences also bear out the success of making co-op incubation more accessible to local partners. CFL is collaborating with the Violence Intervention Program (VIP) to develop the newest Brightly. VIP participated in CFL’s cooperative development training, but, like many participants, did not feel capable of launching a co-op on their own. When CFL announced they wanted to collaborate with a local partner on incubating a new Brightly, VIP jumped at the chance and were thrilled to be selected. With CFL’s support, VIP was able to receive $100,000 for developing the cooperative from the city. The collaboration has been a resounding success, and the newest Brightly currently has 23 members who are meeting weekly to launch their co-op. 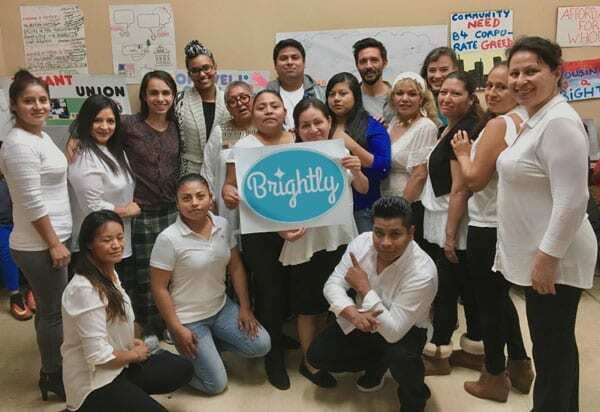 Last year, a group of Latinx housecleaners celebrated the first annual Brightly national convention, perhaps a lofty name for an organization whose only locations are Staten Island and Brooklyn. However, their audacious goal is, within 10 years, to have at least one Brightly co-op franchise in each state, with experienced Brightly members training and developing the new co-ops. Co-op members envision reaching out to vast swaths of the country where large Latinx immigrant communities suffer in exploitative cleaning and childcare industries. It’s a beautiful vision. Of course, policies that support co-ops, such as using public procurement to buy from co-ops and providing tax relief to LLC co-ops would help. Philanthropy that provides multi-year operating support can help too. Finally, members of the general public can vote with their wallets for an economy that works for all by purchasing goods and services from cooperatives in their communities. Emma Yorra wishes to thank Carlos Pacheco, Joe Marraffino, Sarah Yorra, Cheyenna Weber and Mehmet Odekon for helping make this article stronger, and to the people at the Center for Family Life, Brightly, the Northern Manhattan Improvement Corporation, the Violence Intervention Program, Si Se Puede and Beyond Care for generously sharing their perspectives. This article is dedicated to the nearly 15,000 immigrant children being held in detention by the US government. From 1985 to 2004, the nonprofit was called St. Christopher-Ottilie, a name that reflected its two founding organizations. In 2004, the nonprofit changed its name to SCO Family of Services. Emma Yorra lives in Brooklyn, New York. She worked for six years at the Center for Family Life’s Cooperative Development Program and is currently a worker-owner of A Bookkeeping Cooperative and a board member of the Cooperative Development Institute. Last week, the Smithsonian announced the establishment of its first permanent gallery dedicated to Latinx history and culture. Supported by a $10 million donation from the Molina family, the 4,500-square-foot gallery will open in 2021 and be housed at the Museum of American History.